Got questions about Girlicity? You're in the right place! During this step you will have access to the client board where you can see what projects are available. You have the flexibility to choose the client program that you would like to service. Our clients include many Fortune 500 companies such as major telecommunications, cruise lines and the world’s largest online retailer. The Arise client certification courses are typically around 30 days (M-F). Once you certify, you will be offered the opportunity to provide your services to that client and can start work immediately! On the next page, scroll to the bottom and click “Cancel”. You will be cancelled from enrollment. 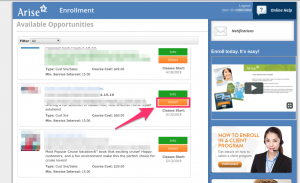 You can also log out of the portal and back in and click “Resume” on the client course enrollment and then click “Cancel”. 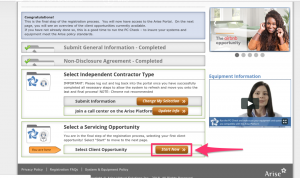 You will now have access to the FULL Arise portal. The client board changes often so if you don’t see a client that suits you, be patient as something may come up that will match your talents and availability. By this time you should have received an invite to join the Girlicity Facebook page. Make sure to join our Facebook page as this is where the client pay rates are posted along with any special voucher offers and important announcements. 1-8-GIRL-I-CITY (1-844-754-2489) Register for a support account.